THIS EXHIBITION IS A TRIBUTE TO A CAMBRIDGE ENGINEERING STUDENT, H.R. RICARDO, WHO GRADUATED IN 1906. 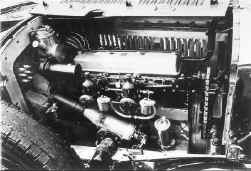 THROUGHOUT HIS UNDERGRADUATE DAYS HE WAS PREOCCUPIED WITH IDEAS FOR THE DEVELOPMENT OF THE INTERNAL COMBUSTION ENGINE, AND MANY OF THE IDEAS THAT WERE TO LATER BEAR FRUIT WERE CONCEIVED IN THIS PERIOD. HE WAS THE FOUNDER AND TECHNICAL DIRECTOR OF A SUCCESSFUL COMPANY, FORMED TO CARRY OUT CONSULTATIVE AND RESEARCH WORK, KNOWN AS RICARDO & CO. 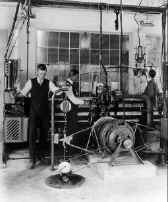 ENGINEERS(1927) LTD.
K.A. KNELL***. SINCE THEN IT HAS BEEN DISPLAYED REGULARLY IN THE ENGINEERING DEPARTMENT AND SEEN BY MANY GENERATIONS OF UNDERGRADUATES. *P.de K. Dykes, Lecturer, University Engineering Department, 1937-76. **F.D. Robinson, Lecturer, University Engineering Department, 1947-85. Fellow of St. Catharines College. *** K.A. Knell. Librarian, University Engineering Department, 1956-84. Fellow Commoner of Sidney Sussex College. 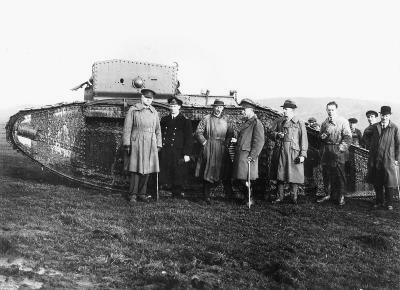 The foundations of Ricardo's career were laid when he helped professor Hopkinson with his research work at Cambridge, but he first became well known when he designed the outstandingly successful engine for tanks when they were first used in the 1914-18 war. 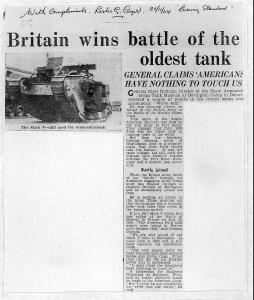 After this war he investigated fuels for petrol engines, and this resulted in drastic changes in the refining and marketing policies of the Shell organisation. In the 1920s he founded and built up the consulting and research firm of Ricardo & Co. at Shoreham. This firm has reached a well-nigh unique position, of great value to the internal combustion engine industry, and Sir Harrys personality has become a byword in these circles. 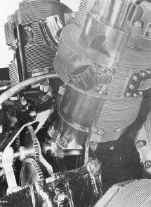 He again contributed to his countrys victory in the 1939-45 war; the Bristol Aeroplane Co. based their sleeve valve engine on Sir Harrys work. 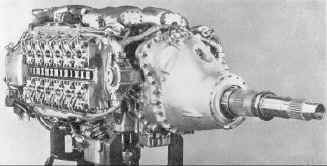 Altogether, 130,000 sleeve valve aero engines were built mostly by the Bristol and Napier companies. He has also left his mark on diesel engines. 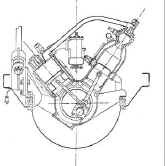 The well known Ricardo "Comet" combustion system has been built into engines all over the world by numerous licensees. 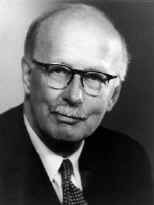 Ricardo was knighted in 1948 in recognition of his work in the field of internal combustion engineering and research. "At Cambridge I started working for the Mechanical Sciences Tripos, but after my first year, Professor Hopkinson invited me to assist him in some researches he was about to undertake into the internal combustion engine. Up to that time, I had taken no special interest in internal combustion engines as such, though the advent of the motor-car, then a fascinating but wayward mechanical toy, had, of course, thrilled me......"
"Hopkinson had his eyes fixed always on the light high-speed engine as the internal combustion engine of the future, and prophesied that, given sufficient turbulence, there was no limit in sight to the speed at which an internal combustion engine could run, and run efficiently; and even today, no such limit is yet in sight......"
"I designed and built in the workshops at Cambridge the first version while I was an undergraduate in 1903-04. This gave quite a promising performance. 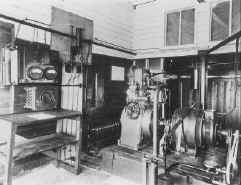 I then designed and built, also in the workshops at Cambridge, an improved version, which was completed in 1905 and was put through fairly thorough calibration tests in the engineering laboratory. After leaving Cambridge I experimented a good deal in my own small workshop with this engine in my own spare time......"
"Early in 1915 I received a letter from Hopkinson, with whom I had rather lost touch for some years, saying that he had been appointed as Technical Director of the newly formed Air Ministry, that since our work together at Cambridge he had grown rather rusty on the subject of internal combustion engines and asking me to prepare for him a note setting forth my own views on the principal factors governing the design and performance of light, high-speed engines......"
"It was relatively easy to screen the tanks from aerial observation even when close behind the front line, but all camouflage would be useless in the face of exhaust smoke (which was plentiful in the existing sleeve valve Daimler engines). 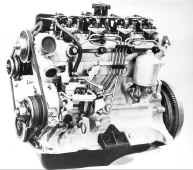 It seemed that all the automobile manufacturers already had their hands full, either with military vehicles or with aircraft engines which at that time had first priority. 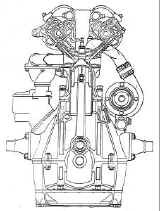 It was apparent, therefore, that an entirely new engine would have to be designed and built. 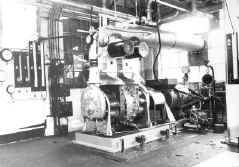 Through my grandfather firm I was in touch with a number of the manufacturers of large industrial engines, such as Mirrlees, Crossley and others, and I was asked to canvass these to find out whether they had the capacity and were willing to tackle the construction of such an engine. I found them riot only willing hut eager to do this, but not to tackle the design, which they said was quite outside their range of experience. I reported this to Tennyson dEyncourt who replied: "You seem to have a pretty good idea of what is required. Will you undertake it?........." 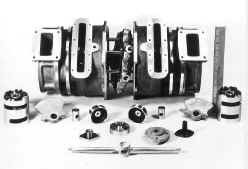 "Looking back I think that the success of these engines was due very largely to the use of the crosshead piston. 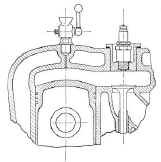 In general the piston is one of the most vulnerable parts of any internal combustion engine, but in the case of the crosshead piston, thanks to the very efficient air cooling and to its separate system of lubrication, the pistons themselves were virtually quite trouble-free. Once we had nailed down and cured the "barking dog" trouble, we never had the slightest trouble with the pistons......."
In the 1914-18 War once the fronts were stabilised the odds were all on the defending side. 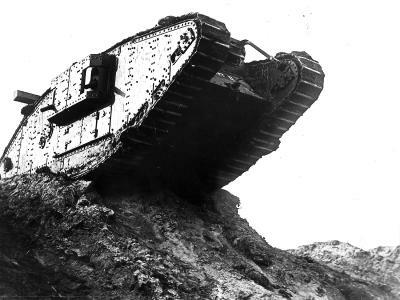 While the machine-gun dominated the battlefield, no frontal assault had much chance, and no flank attack was possible because the Western Front had no flanks. 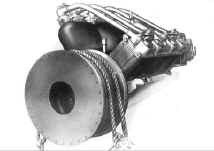 (d) The Comet Mark III compression swirl chamber. 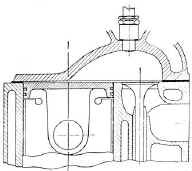 The most famous of all diesel combustion chambers, this design embodied intense swirl with a reasonable rate of pressure rise and good fuel consumption. In its latest form it is still one of the most widely used chambers when, power rather than economy, is the prime consideration. 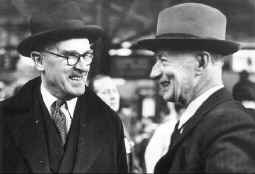 It was the subject of a lengthy legal battle about infringement of Patent rights between Riccardos and Rootes Bros. won by Ricardos who were represented by a young lawyer named Stafford Cripps (later to become Chancellor of the Exchequer). 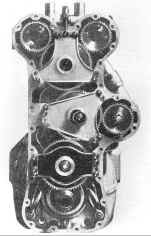 The E-35 was the first variable compression engine designed by Sir Harry. On it much early classical work on the characteristics of (then) unknown hydrocarbons was undertaken and the concept of Highest Useful Compression Ratio derived. 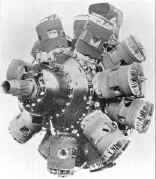 "About this time I had became very interested in aero-engines and built myself an experimental four-cycle engine with variable supercharge, with the object of maintaining ground-level power at high altitudes. This took about two years of spare time to make; it worked quite well, but in those days. I failed to rouse any interest in it, for I was met by the reply that aeroplanes would never fly high enough to need supercharging." 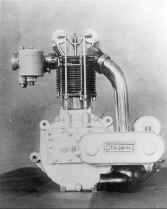 E-25 Single sleeve valve single cylinder research engine. 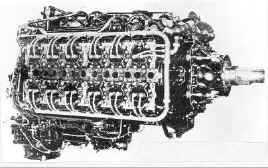 This engine carried a load of 520 lb per sq. in. 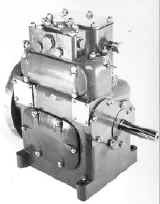 B. M. E. P. when engaged in supercharging tests in the 1930s. 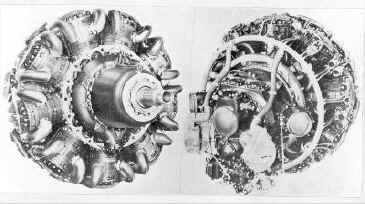 From this kind of work was evolved the successful sleeve valve aircraft engines which alone among the belligerents the British used. 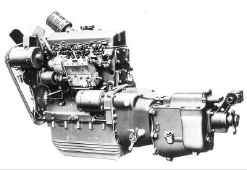 The Perseus, Hercules, Taurus, Centaurus from Bristols, the Rolls-Royce Eagle, and the Napier Sabre produced 200, 000, 000 H. P. during the war years. 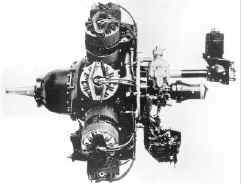 In fact the Rolls-Royce Merlin and Griffon were the only common British poppet valve aircraft engines by 1945. 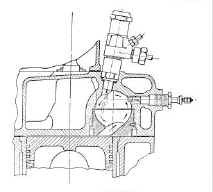 The sleeve, cylinder and piston have been cut to show more detail. The shape of the ports can be clearly seen at the top of the sleeve. 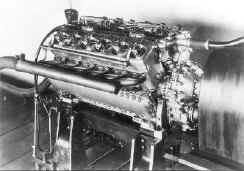 From the 1930s onwards Ricardo petrol and diesel engines were developed to power various makes of car including Bentley, Citroen and Peugeot. 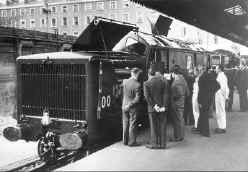 In 1951 Ricardo & Co. acted as consultants on the FELL diesel-mechanical locomotive. Ricardo & Co. were consultants on this project. 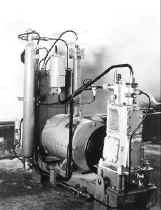 Ricardo & Co were also active in developing a range of compressors for various purposes. 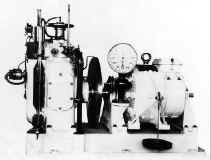 These included a special type of oxygen compressor made in some quantity for the Admiralty. Highly compressed oxygen will react with lubricating oil to form an explosive mixture. 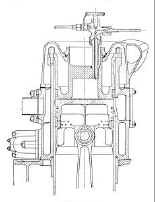 This reciprocating compressor was designed to have water lubrication. Great care was paid to the tolerances and to the choice of materials. 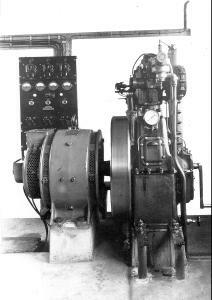 The steam engine shown below was built in conjunction with the National Research and Development Corporation (the purpose of which is to finance likely inventions) with a view, to selling it on the Indian market. 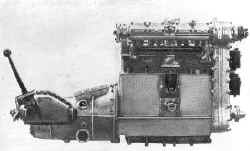 The idea was that the Indian village community should have some other source of power than bullocks, and this engine had a boiler which could burn any fuel including brushwood and camel dung. 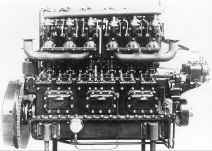 The scheme was not a success partly because the engine is still too elaborate, partly because oil engines are at least as convenient, and partly because the conservatism of the Indian village was underestimated. H. R. Ricardo, Memories and Machines. Constable 1968. 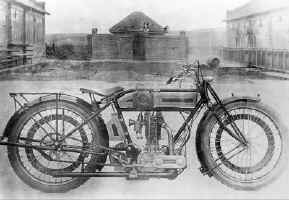 L. R. Higgins, Britains Racing Motor-Cycles. Foulis 1953. T.R. Henn, Science in Writing. Photographs and diagrams from Sir Harry Ricardo's Presidential Address, 1944 (Proceedings of the Institution of Mechanical Engineers, vol. 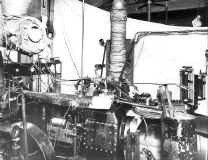 152, 1945) are reproduced by courtesy of the Council of the Institution. Correspondence to: The Secretary, CUED, Trumpington Street, Cambridge CB2 1PZ, UK. Web pages devised and compiled by K.C.A. Smith (Cambridge, Easter Term 2000).